My husband travels all over the world and sometimes I'm lucky enough to go with him. And whenever I go to these places, I wander around taking lots of photographs, eating good food, and meeting local people while he works. (A writer's life is tough!) In 2011, I invited two little bears to accompany me on my trips. Hector and Blanche are the Explorer Bears. They have their own web site and a blog. That's Hector on the right. Blanche is below, making friends in San Francisco. Please visit the Explorer Bears web site, and encourage any kids in your life to do so too. 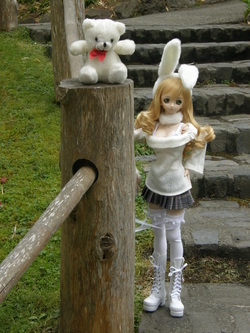 Blanche making a new friend at the Japanese Tea Garden in Golden Gate Park, San Francisco.